Twenty-five years ago Special Ideas took the bold step of moving from pamphlets and T-shirts to full books. 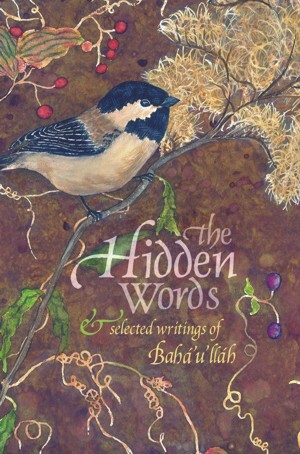 Our first major publication was a pocket edition of The Hidden Words. We had been told by other publishers that “the last thing we need is another edition of The Hidden Words,” but we decided to print one anyway. The “Chickadee Edition” was an instant success, with the first 20,000 selling out within a year. Many additional printings followed, with total sales approaching half a million copies. To celebrate this milestone in our company – and in the availability of low-cost teaching materials – we are reducing the price of all of our pack sizes by 25%. That means that you can buy 5 for $1.25 each, 40 for 94¢ each, or a case of 200 for only 75¢ each. Think about that. The essence of all revealed truth for only 75¢. This sale will last until the Bicentenary Celebration in October. (Wouldn’t it be nice to offer them at your celebration?) But don’t wait. If history is any indication, the 20,000 in my warehouse could be gone by summer. (a) It is very pretty. (b) The type is larger and easier to read than many. (c) It opens with a welcoming invitation. (d) The cover & invitation mention other religions. (e) It includes extra pages of prayers, quotations, history & principles. (f) It is currently bulk priced at 1/8th the price of the red softcover edition. (g) I offer free advice on how to use this edition for teaching. (h) It matches our prayer book, A Gift of Prayers for a handsome gift set. BTW: Now would also be a good time to order our Rejoice It’s Ridvan Banner.